Kami Kilgore from No Diets Allowed is back with another yummy. Today she’s made a de-lish stew… perfect addition to the chilly fall evenings. Take it away Kami! I’m a busy wife and mom AND I know I’m not alone (thanks for being crazy busy with me). Just because we have many hats to wear doesn’t mean we need to compromise on having healthy dinners! I’ve already shared some quick and easy healthy dinners like my Turkey and Black Bean Baked Burritos and my Avocado Tuna Grilled Cheese Sandwich. Oh, how could I forget about my Shepard’s Pie? Well, sit back and relax, my friends. I’ve got another quick and easy one that you’ll fall head-over-heels for! In a large skillet over medium heat, cook sausage until brown or even slightly blackened. Add sweet potato, potato, carrots, garlic salt, and red pepper. Stir well and then pour hot water over mixture. Bring to a boil and reduce heat. Simmer for 20 minutes until potatoes and carrots are soft. Garnish with parsley. Just a couple tips. 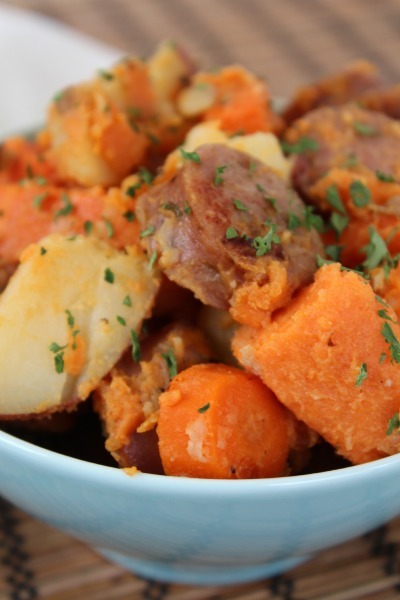 If the potatoes and carrots are still NOT soft after all the water has evaporated, just add another 1/2 cup of hot water and continue to simmer. If the potatoes and carrots are soft and there is remaining water, just pour out the remaining liquid and season as needed. 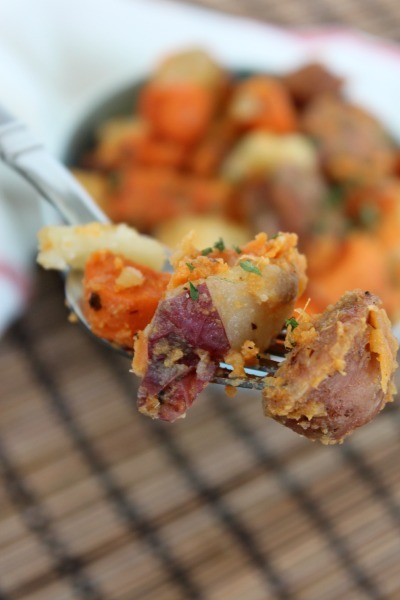 This recipe evolved from one of our favorite go-to dinners, Smoked Kielbasa with Potatoes and Carrots. I’m always thinking of ways to make healthy recipes enjoyable, quick, and easy. If you can love what you’re eating AND make it healthy too, why not? Come check out more recipes at No Diets Allowed. Thanks again, Michelle, for letting me visit!